ConnJam 2018 will take place at the Orange Fairgrounds, 525 Orange Center Road, today (Friday) through Sunday. The Boy Scouts of America along with the CT Yankee Council of BSA hosts this event every three years in Connecticut. The last three ConnJam events were held in Orange at the town’s fairgrounds and in 2018 the event returns and will be held in Orange for the fourth time in history. The committee searches possible locations to hold 5,000+ scouts during the weekend event. “The town of Orange was chosen again this year due to the central location in the state, the local suppliers willing to help, and the local town departments that work with our committee in making this all happen,” said Jeff Cap from Orange. Cap is the liaison between the Town of Orange departments and the Boy Scouts of America. This is his fourth ConnJam event that he’s held this position, along with other town residents involved with scouting. The Town of Orange has been very lucky to host this event now four times in a row over the last twelve years. 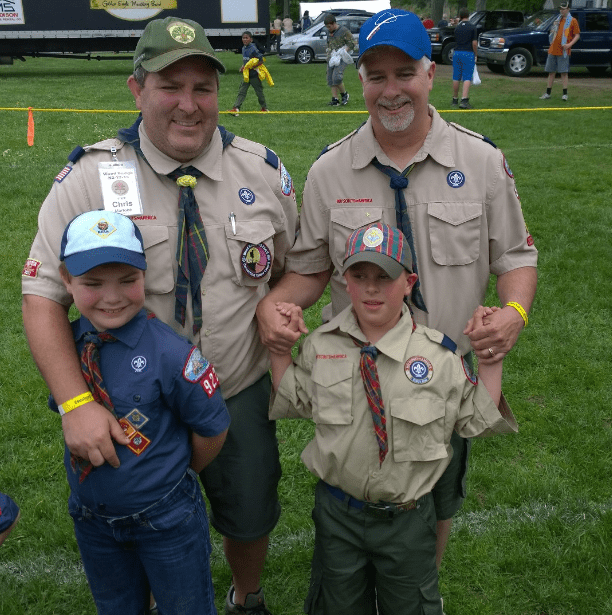 “As of today, there are more than 3,000 scouts registered to sleep over the entire weekend and another 1,000+ scouts as Saturday-only visitors, along with their families, who are attending this great event. Some of this year’s program highlights are Cast Iron Chef with a celebrity Chef from the Cooking Channel, STEM Activities, Mountain Bikes, Climbing Walls, Radio Scouting, Scuba Diving, Log Rolling, Hatchet/Knife Throwing, Paintball Target Shooting, Zip Lines, Giant Inflatable Courses, Scouting Museum, Chess Tournaments, along with the US Coast Guard Helicopter Flying a Rescue Demonstration, US Army Reserve, US Navy, Local Police and Fire Demos, Stratford K9 Corps. And this is just a small taste of all the activities taking place at the Orange Fairgrounds this weekend at ConnJam. Special guest at the ConnJam show is Michael J. Manyak, MD who is an internationally known explorer, innovator, and physician, presenting “A Peak into the World of Exploration” followed by a spectacular firework show. For information on joining scouting you can visit www.BeaScout.org or for additional information on the ConnJam event visit http://www.ctyankee.org/program/connjam.